While the cycling community will stick together on a lot of things, there are a lot of heated debates in cycling that have fellow cyclists at odds with each other about what is the ‘right’ opinion to have. Just like the many, many fervent discussions we see over religion and politics, cyclists will argue with you on certain issues till they’re blue in the face about issues from the very big to the practically miniscule – but what’s life without a bit of heated debate, huh? There is a lot of disagree when it comes to whether we should be forced to wear helmet, or even if we should wear helmets at all in some circles. In some countries, like Australia, wearing a helmet is mandatory and punishable by law if you are caught without one, although Mexico had a similar law in place but eventually repealed it, so there is no international consensus on this. In England, it is our choice to wear a helmet or not, for better or worse. Those against helmet legislation say that making helmets mandatory will only put people off cycling, which would be disastrous as cycling has many health benefits that come with it. Although on the other side of the debate people argue that there needs to be laws to make clear to people that riding without a helmet is posing a serious risk to your health, much like driving a car without the use of your seat belt. Are Electric Bikes Basically Cheating? Electric bikes (e-bikes) are a real point of contention within the cycling community – marmite with wheels, if you like. Some absolutely love the assistance you can get from an e-bike especially when it’s your mode of transport for your commute, after all, you’ve had a hard day and all you want to do is hop on your giant e-bike and let it take you home as quickly and easily as possible. Cycling ‘purists’, on the other hand, absolutely despise e-bikes and everything they stand for, some even going as far to liken it to cheating. At the end of the day, it all comes down to personal preference – just because you don’t enjoy something doesn’t mean you should be talking down something somebody else loves! One of the biggest disadvantages that bikes have over cars is a lack of radio, which some cyclists compensate for by riding with their headphones in – but this is a risk you are putting yourself in. 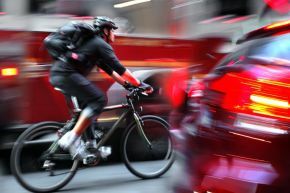 Whilst riding your bike your wits should be sharp as you will need to stay alert at all times, so if you can’t hear the outside world this raises a serious problem. A good compromise in this situation is to keep noise levels within your headphones on the lower side, so you still have an awareness of what’s going around you – getting yourself a pair that don’t rest in your ear canal can help with this. You may not be as ‘in the moment’ listening to your Tina Turner mix as you may like, but at least you’ll be safe.